Again, this recipe is from Our Best Bites, one of my favorite recipe sites. I made these with the Tortellini Sausage Soup the other day and fell in love. And they really are easy. If you are nervous about using yeast, give these a try. I still consider myself a novice when it comes to bread making and I think this recipe is very forgiving for the beginner. 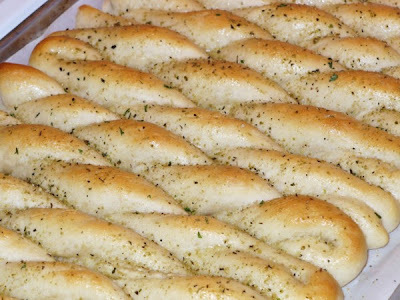 I'm also including their recipe for Garlic Bread Seasoning, because that is what makes these breadsticks so great. The recipe makes a lot, so store the extra in an airtight container in the fridge to use as needed. 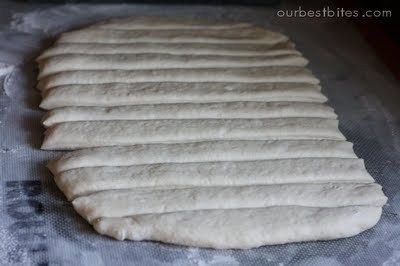 If you are not sure about rolling out the dough and twisting it, just cut it into strips and leave it at that. Nobody will care what they look like once they take a bite. In fact, I may just skip the whole twisting part myself next time. It's simpler and faster that way. Use a thermometer (a candy one works fine) to measure the temp of your water. Roll out each piece of dough into a snake and then drape over your forefinger and twist the dough. Place on baking sheet and repeat with remaining 11 pieces of dough. Combine all ingredients and store in an airtight container in the fridge. Use as needed. *Since making this last, I've decided to reduce the oregano to 1 tsp. But that's mostly because I'm not a big fan of oregano - it's just personal taste. Thank you for sharing this recipe! The bread looks and sounds tasty, and I will make it as soon as possible!